How to stop life and limb endless tokens? What triggers first? Stronghold Assassin or Grave Pact? Sacrifice a creature: Destroy target nonblack creature. I have Squee, the Immortal in the deck. Is there a point to have the 2 version? 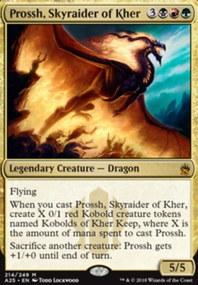 Also a Rekindling Phoenix and a Goblin Chainwhirler incoming. I will include Stronghold Assassin , Viscera Seer and Mazirek, Kraul Death Priest . The hard choice is what to remove. Getting rid of attacks sorcery like Overrun , Overwhelming Stampede ? Also, Farseek ? I feel I havn't enough mana accelator. Goblin Grenade / Goblin War Strike ; only one of the two, or none? As for creatures, removing Goblin Cratermaker , Jund Hackblade and Pawn of Ulamog ? Dictate of Erebos : Just another Grave Pact really. Great in any sac deck. Stronghold Assassin : Easy residual removal, just like Attrition . 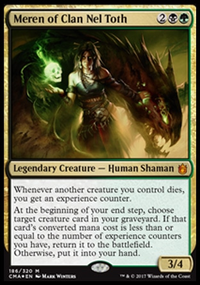 Vraska, Golgari Queen is a pretty decent sac outlet and she can become a win condition. Fecundity : Good draw if you don't mind the grouphug effect. Deathreap Ritual has good draw without the downside other than being higher CMC. I also don't think the mana curve really requires 40 lands, you could definitely take out a few if you have more cards you want to swap in. I haven't done a lot of research on zombies, but I learned from my old token deck that it takes a lot of trial and error to get the balance between token producers, pump spells, and abusers. Josu Vess, Lich Knight - With green to help you ramp, this deck has a better chance of kicking him than other zombie decks. Open the Graves - More Tokens. Underrealm Lich - Card draw is always good. Varina, Lich Queen - Card draw, more tokens, and some lifegain to help keep you healthy for those life costs. Kodama's Reach, Rampant Growth, etc - I always feel like land ramp is more reliable than artifact ramp, especially in green, but this is just preference. You do seem to be lacking a bunch of ramp to keep those activated abilities from slowing you down. 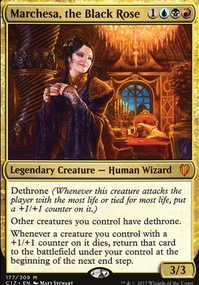 Death Baron - Another lord, but gives deathtouch too Carrion Feeder - Free sac outlet, if you are looking for one. Pontiff of Blight - If you have solid ramp, giving all your creatures extort can get really dumb. Graveborn Muse - Might kill, but you will draw your entire deck with the right board state. Risen Executioner - Another lord with recursion Corpse Harvester - Tutor a zombie and a land. Noxious Ghoul - Could be spicy 1 sided board wipe Phyrexian Crusader - Possible 1 shot, but only if you have the right amount of pump. Shepherd of Rot - Could kill everyone. Good way to get around pillow fort and fogs. Raving Dead - Fun spice. Balthor the Defiled - Pretty good recursion. Right now Archetype of Imagination is the only non black creature. Dralnu, Lich Lord - You don't have that many instants and sorceries, but what you do have is strong. I think it reduces Army of the Damned's Flashback. Boneknitter - Tribal protection. Anguished Unmaking, Swords to Plowshares, Counterspell etc - some single target removal is always useful, and you are in amazing colors for it. I have this problem with my dragon deck. Second Harvest, Parallel Evolution - One time token doublers Craterhoof Behemoth, Overrun, Triumph of the Hordes - Ends games. Bramble Sovereign - Not a zombie, but this can do WORK. City of Brass, Mana Confluence, Reflecting Pool - 4 colors needs as much color fixing as possible. Esper Panorama - OK fetchland Krosan Verge - Underestimated fetch imo Fecundity - Crazy card draw Austere Command Merciless Eviction Cleansing Nova - A few more wipes. But these let you interact with artifacts and enchantments that this deck does not seem to do well. Stronghold Assassin - effects like Dictate of Erebos, Grave Pact, and even Attrition are just better. Archetype of Imagination - I appreciate that you are trying to deal with a weakness in the deck while giving your creatures evasion. But, aren't zombie's looking to die for LTB effects? It also costs a lot. Grave Betrayal - Costs a bit too much for me, but a strong effect. I'm up in the air about this. Jarad, Golgari Lich Lord - Might be rough to cast in 4 colors Conspiracy - I might be missing something, but almost all of your creatures are zombies already. Skullbriar, the Walking Grave - Just seems like a beat stick that is hard to pump up. Vulturous Zombie - easier to pump up, but still feels like just another beat stick. Your mana issue is simply that you don't have enough land. Without being in green, or having an extremely bottom-heavy curve, you should never go below 33 lands on principle, and rarely go below 35 without high-level mana rocks like Mana Crypt & Mana Vault or lands like Ancient Tomb. Additionally, lands that come into play tapped for little value like Skyline Cascade, Mortuary Mire, Halimar Depths, Ebon Stronghold, and Bottomless Vault would better serve you as basics. If you're not proliferating, a storage land like Ebon Stronghold isn't very good. I understand that you want to store up mana for your big spells, but imagine if you ran Ashnod's Altar instead. With all the zombie tokens you can make, it's much better acceleration that doesn't tie down a land for several turns. 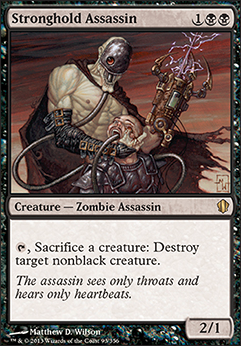 Corpse Harvester can also turn your tokens or otherwise expended zombies into ramp and tutor for more relevant zombies. Sleep, Ghoulcaller's Chant, Ashiok, Painful Quandary, Followed Footsteps(note 1), Infernal Tribute, Royal Assassin(note 2), Posessed Skab, and Stuffy Doll are all easy cuts for either being off-theme, or inefficient when playing EDH. Manalith and Searchlight should probably become Charcoal Diamond and Sky Diamond, while Thaumatic Compass becomes Dimir Signet. Finally, the biggest change would be putting Scarab God as the General. While Grim-Grin can be powerful and close games out by hitting 21 damage quite quickly, the scry that scarab god gives you when you're playing zombie tribal is unreal. Plus he's so resilient and dodges the increasing casting cost by returning to your hand. These two points are especially relevant when we consider that your main complaint is being on the losing end of mana variance. n1: If you really need the Followed Footsteps effect, just use Helm of the Host, it's better in almost every respect. n2: Unless you meant Rathi Assassin or Stronghold Assassin, which are both zombies. 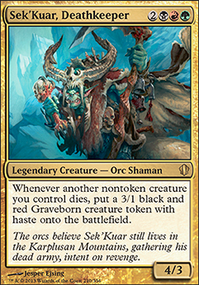 If you want to lower the curve of your deck Attrition, Relentless Dead, Gravecrawler, Undercity Informer, Yahenni, Undying Partisan, Stronghold Assassin and Flesh Carver all help lower your curve, while either giving you more thrulls, or more things to do with your thrulls. If you want mana, Black Market is wonderful, and Expedition Map or Diabolic Tutor can help you find your Cabal Coffers in a hurry. NV_1980 on Bring Out Your Dead! Out: Endless Ranks of the Dead; In: Graveborn Muse. I was facing the same problem you mentioned with Ranks, and I could always use some more draw. Out: Stronghold Assassin; In: Fleshbag Marauder. You are very right about Assassin not being usable right after it enters play. In that sense, Marauder is much stronger (especially since it targets all opponents instead of just a single creature). Out: Thornbite Staff; In: Sidisi, Undead Vizier. What was I thinking not including this earlier?!? She's spectacularly strong with Gisa and Geralf as she is able to exploit herself, making her a reusable tutor. The Staff has some fun utility uses, but not enough to be included in this deck. Also, I found the equip costs are rather high. I gave your other suggestions a once-over but I've decided to hold off on them until I've played the deck some more. Thanks again! Also for the upvote(s)!